A rather unusual hand made paper doll. The 3" paper doll is a cutout from a magazine and depicts a rear profile of an older woman. This is a handmade, unbound, book of seven drawings and a cover page. Each page features a drawing, done in pen, of a woman wearing the fashions of the day. Each drawing is signed with the initials M.S. On the back cover there is the inscription "Mary Stevens to Wynna, 1910"
This book was obviously meant to be bound, as there are two wholes drilled at the top of each page. Whether the binding was lost, or never completed is unknown. The front and back cover are slightly soiled, but the interior pages of drawings are in great condition. At first glance one sees an artfully executed watercolor stem with leaves topped by blue and yellow polished paper pinwheel flowers. Upon close examination one sees that the flowers open to display a different hand penned answer beneath each of the petals. The reverse explains this Victorian key to one's fate and love life. It is a Prophetic Flower. Each of the five (5) flowers foresees ones Fate, Character, Wish, Ruling Passion and When to be Married. It measures 8 3/4" x 7" and is on heavy stock card. c1850s..
A 10” x 13” mount board with watercolor of a young woman seated while reading a book. Elaborate border decoration reflecting the sky and seasons. Artist signature at base III. G. Fall..
A Hand Constructed Promotion with Calendar and Card for a Baker and Caterer, Sanford ME with Real Cake Icing Adorning the Cover. c1902. . ..
A 5 1/4" x 4 1/4" single fold heavy card stock promotion with real cake icing adorning the front cover. The inside has an applied calendar pad for 1902 at left and a promotional card featuring an image from a photograph captioned "Tebbett's and his "Six Little Bakers' (depicting his family at work). It promotes the Baker and Caterer, with wedding cakes a specialty. Sanford Maine. Back page blank. Wm. Miller & Bro., Acworth, N.H. Printer. . Surface wear. Fold reinforced with archival tape. An 8" x 10" piece with geometrically positioned saw-tooth cut hearts in various colors with a plaited eternal ring of hair at center with a cut-out embossed flower at center. A verse in faint ink in background is titled Star of Memory. Dedicated to Mrs. Jennett L. Johnson by Mrs. H. C. Barney Includes transcription of the verse. . Handmade Perforated or Punch Paper Needlepoint “patch” envelope. .. Measures 5” x 3 ½” with needlepoint strip across that top that has a handmade patch or court plaster envelope attached. Needlepoint floral array on each side of base. Floral decoration at top. c1860s. .
A Letter to Santa Claus – written in rhyming verse and asking for more for the poor children. A pen and ink letter written on two 9 ½” x 4 ½” stock cut in the shape of a stocking. . ..
Two (2) stocking shaped pages tied together with string. Written in pencil at the top is "Robert B." A 2 3/4" x3 1/4" ten page menu cut in the shape of a leaf with a ribbon tie 'binding'. The first page is a verse by Burns beginning with"some hae meat that caan' eat And some could eat that want it:..." A rebus on each page identifies the dish being served. My personal ability to solve this particular rebus are limited, but I can say they are having some sort of gravy and pie... Pen and ink and watercolor.. Slight toning due to age, otherwise fine. Large format with pen and ink cover decoration. Includes ten (10) pages with seventeen (17) different samples. Each sample is captioned identifying the work and is accompanied by a magazine cut-out showing an example of the work on a garment. 11” x 14 ½”. Meticulous work. Minimal cover wear. Heavy board with yarn bounding. Typewritten commentary describing each watercolor illustration beginning with fashions from 1810 through 1870 (Plates I-IX) depicting Finnish garb or "Sulkava". The remaining plates (X-IVX) are modern adaptations of the earlier styles. The final plate is cut paper silhouettes. A well executed and informative project completed by a University of California student. Measures 12 1/2" x 9 1/2"..
DeBale 4 Original Works - Vibrant Splatter Art - Africans & Ostriches. .. Vibrant splatter art watercolors. Three (3) of the four (4) watercolors are abstract stylized stereotypic Africans; two are drummers and dancers, the third a group of hunters. The final image is three (4) pair of ostriches. Each measures 10" x 13". .
Miniature Sand Painting - Brading Ecclesiastical Parish, Worked on Lace Paper. ..
A 1 1/2" x 2 1/2" scene created using applied color sand with watercolor background. It depicts the Ecclesiastical Parish in Brading, the 'Kynges Towne'. Created on 2 5/8"x 3 3/4" die-cut card with lace paper border.. Portion of sand lacking. Miniature Sand Painting - The Dairyman's Cottage, Worked on Lace Paper. ..
A 1 1/2" x 2 1/2" scene created using applied color sand with watercolor background. It depicts The Dairyman's Cottage.. Created on 2 5/8"x 3 3/4" die-cut card with lace paper border..
A 3 3/4" x 2 1/2" card with a finely detailed 2 1/2" watercolor silhouette of a proper women. Note the detailing of her hair, earring, finger ring and nosegay bouquet. Applied paper on reverse is written in German and dated 1848..
Two (2) small handmade card games with paper slip cases.Created in pencil. Both sets are complete. The message on the first set reads Helen from Ray Xmas 1888 Game of Animals Played Like Authors. It includes 46 cards each ordered A-N, each card has a number at top and lists different animals and the number of cards in that letters group or set. The animals are grouped by family or region. The top animal on the card is underlined. The letters identifying the cards do not relate to the animal names. Letter L- Baboon, Monkey, Gorilla; Letter B - Polar Bear, Walrus, Seal. Cards measure 2 1/2" x 2". The message on the second set reads The Game of Birds invented by Lucius Tuttle on the front and Helen H. Morris from Lucius Tuttle, Xmas 1888. Dec. 25, 1888 on the reverse of the slip cover. This set includes a single fold instruction booklet. Played like Great Battle Fields; Artists, Politics, etc. It lists the rules for play. Decorated covers. t includes 40 cards organized in 10 groups of 4 ordered A-J. Each card with a primary and 3 secondary birds. Cards measure 2 1/2" x 2". 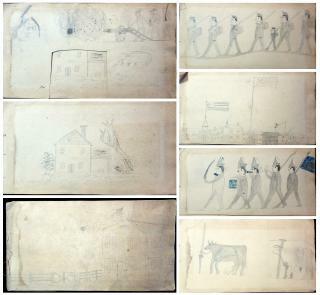 Charming and dear..
A Young Lad's 200" long Scroll Picture Story. .Chelsea (Boston) . A 2 3/4" x 200" scroll picture story created by a young boy. Created in a naive hand black crayon. References to Chelsea (MA). The events of a young boy's real or imaginary daily life. It begins with scenes of perhaps a school or common building, a pound with geese and swans and a home, followed by a bull in a field, a paddle boat and sailboat in water nearby. This is followed by a scene of the horse drawn Chelsea laundry wagon and a battalion of firefighters pulling pump No. 1 to a burning house. This is followed by a column or section marker and random animals and people. The boy's next experience is a train with an arch reading "Look Out for Engine", another scene of the Chelsea Laundry wagon, this time on a bridge and going in the opposite direction with an approaching rider, perhaps a soldier on a horse and a drawbridge in the background ending with a parade of soldiers followed by a cannon; Another section break. A military vessel, sailboat and a lighthouse a ship and a vessel..
A 32 pp book with pen drawings with watercolor and crayon embellishment. "First year infants class 1951" written in pencil on the front cover. String binding. A well executed and slightly naive book created to assist young children in learning phonics. In most instances it includes the first letter of the sound and a relevant scene. Interspersed are two and three letter words. It concludes with numbers 1 through 5 with supporting imagery. Creative and charming; "Z" is the sound a bee makes and,"Wh" is the sound of blowing out a candle. Measures 9 1/2" x 7 1/2". 12 leaves. vellum, bound with braided silk tie. Cover reads "Baby's Book" With quote at top "each day sees some rare unfolding of the sweet young life, the dawning of a new intelligence" from A Child Shall Lead Them. Elaborately penned with watercolor illustrations. The next page is a verse entitled "Babies Skies" This is followed by Monday's Child is Fair of Face. The remainder of the book is structured with tradition information found in a baby book, however not in a traditional format. The page with birth information has an illuminated BORN at top; upon closer examination there is a stork's nest with a mother stork and baby nestled atop the"B". Another commonality with the traditional baby book is that it is not completed beyond the inclusion of the baby's name and birth date.... Measures 10 3/4" x 10 1/4". A fine piece. A 12" x 23" original tempera work. A stenciled orange naive paper doll chain across the page backed in yellow with green accents. John F. Kennedy penned at top. "Children are the World's Most Valuable Resource and its Best Hope for the Future" penned at base. The vibrant colors of the mid to late 1960s. Unidentified. 1/4" x 1/2" water stain bottom margin with minimal detraction. A hard cover folio with a watercolor of an elegant lady holding a feather fan on the front cover. The insert is a Ladies' Laundry List booklet. It includes approximately 75 unused pages of items to be laundered. The left side is the laundry list to be retained by "The Lady" and the right side list to go with the laundry. The form includes the date number of items to be laundered and the cost of laundry. In it's original blank box. Measures 4 1/2" x 5 3/4". . Bend, front cover insert booklet. A handmade song book with over 50 songs. The book has been divided up into seven categories: Traditional, Autumn, Winter, Spring, Animals, Special Occasions, People, and Games . The majority of the songs in this book are short nursery songs, such as 'Twinkle, Twinkle, Little Star', 'Rock-a-bye Baby', and 'Rain, Rain, Go Away'. The book is made from construction paper which each page a different color. Pasted onto the page is the handwritten song, with the music and lyrics. Additionally, on the top right, the author has written the origin of the song. Adding even more charm to this book, relevant pictures or cutouts are added to each page. For example, a cut out of an umbrella on the page with the 'Rain Song' or an image of a church's steeple on the page for 'Glad Easter is Here'. At the front of the book is a page that lists all the songs found within. The book is bound together with two metal rings. Measures 9" x 6". https://photos.app.goo.gl/io69lZBGb9aKmAfY2. The front cover is detached, as well as a few interior pages. The color of the construction pages is sometimes faded along the edges. A 6" handmade pen and ink and watercolor Jenny Lind paper doll with 4 cut and one uncut costume. The uncut costume has two guards pencils in the background. Fine replicas copied from the Albert Davis Collection of prints. . Johanna Maria Lind (6 October 1820 – 2 November 1887), better known as Jenny Lind, was a Swedish opera singer, often known as the "Swedish Nightingale". One of the most highly regarded singers of the 19th century, she performed in soprano roles in opera in Sweden and across Europe, and undertook an extraordinarily popular concert tour of America beginning in 1850. She was a member of the Royal Swedish Academy of Music from 1840. 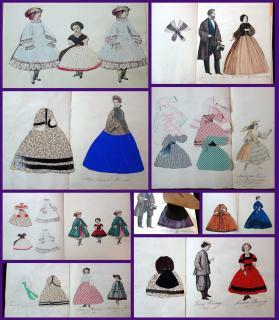 A 6 3/4" young woman paper doll with day dresses,party dresses and a night gown, The five (5) outfits with hats are a mixture of day and evening wear. One of the outfits is a coat with a ruffled base. Two dresses with intact tears that have been reinforced with archival tape. Three tabs lacking; otherwise fine. Reverse is blank..
A 7 3/4" male and slightly shorter female two-sided paper dolls. They are drawn in the style of the Brave Boy and the Little Girl He in dashing finery with a sword and feathered hat, she in her outing attire with her dog at her side. Both with creative license, but well executed in the style of. . Remnant Circular, Spring Season, 1888. Hood, Bonbright & Co. .Philadelphia. A single fold circular with information on lengths, manufacturer and fabric type and price per pound or yard. Special attention is invited to Remnants of Wool Cassimers and Dress Goods, which we sell at a very large concession below list prices. Terms included. The back page is an illustration of the buildings exterior, located at 11th & Market Streets. Measures 9 1/4" x 5 3/4". Letter folds..
32 Edition. 24pp. Includes a description of scale and definition of technical parts, taking measures,notes for beginners, for drafting the back, for drafting the front, tracing front, drafting sleeves, etc. The tool allowed the cutting of all styles of patterns without refitting. Illuistrated. Measures 9" x 6". .
32 pp. Information on Perfection Tailor Body System, Perfection Tailor Sleeve Rule, Perfection Tailor Skirt and Collar Rules. Illustrations throughout. Includes instructions for women's and children's garments. Measures 9" x 5 3/4". .
A 6 1/4" x 4 1/4" envelop with three (3)paper pattern pieces within and six (6) cut muslin pieces ready to sew and construct. Instructions on reverse. A simple animal with pieces for the body section, inside leg and ear. Placements for ears and a bead eye. Light wrinkling. Appears to be a project a child could either do or participate in. Sheep body piece 6 1/2" x 10"..
Two (2) sets of manuscript student exercises created by a Frist Year MIT student. The first is titles Problems in Descriptive Geometry drawn by W. A. Prentiss with five (5) plates and 50 problems. Measures 9 1/2" x 13 1/2". The second is 12 of 13 plates (No. 7 lacking) with an array of drawings including Rivets drawn full size, Angle and T iron, Eccentric, drawings from models and Problems from Projections. Measures 13 1/2" x 20". .
A prey to Surgeon and Physicians? Another is Fannette 1 at June 08 21in. jointed bicycle. A total of 16 dolls including china, bisque, rag, a 'vervay' and others. Dear..
Children's July 4th Hand Made Fireworks Package Prototype . .c1940s. 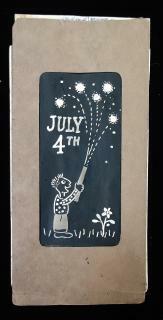 This proto-type fireworks packet for children is in celebration of the Fourth of July. It features a child outside on some grass holding a firecracker container with five small bursts above him in the sky, and "July 4th" written next to it. The handcrafted card is done on black paper with the details in white, behind the paper has been painted various colors and is backed by foil, which would result in the color coming through when the light catches the card correctly. Measures 7 1/2" x 3 1/2". Housed in an 8 1/2" x 6 3/4" plain blue booklet that when opened reveals a collection of 25 cut-out paper characters from fashion plates. Each of the characters has been affixed to a page and captioned with the name of an individual and their age. The child who created the book then created hand made costumes for each of the characters. They are meticulously constructed with applied or hand drawn details. - one doll or character Mathilde Louise Baumgarten, 13 years old has 6 costumes. Many are constructed from printed papers while others are watercolor or pen and ink. A charming selection of dolls and costumes..